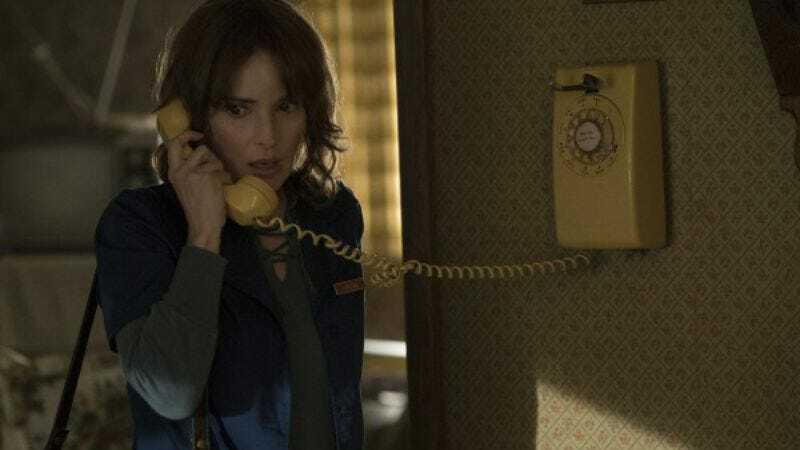 Winona Ryder might not be filming that Beetlejuice sequel anytime soon, but she will appear in some spooky environs as part of Netflix’s Stranger Things. The series, from Wayward Pines’ Matt and Ross Duffer, is being described as a “love letter to the ubiquitous cult classics of the ’80s.” That’s presumably a reference to cult films like The Lost Boys and The Evil Dead rather than Fast Times At Ridgemont High and Ferris Bueller’s Day Off, and not some combination of them. At least, that’s the impression we’ve gotten from these new set photos, which capture such freaky occurrences as Ryder using a rotary phone—what even is that?, our younger readers ask—and a ghost who sort of knows their ABCs. Yep, everyone looks suitably worried about the spooky mystery that’s at the heart of the show, namely, the disappearance of Joyce’s (Ryder) son. And there’s The Equalizer’s David Harbour as the “weary and disheveled” police chief we were promised when the series was announced last summer. Matthew Modine isn’t pictured, nor is his role described in the synopsis below, unless that’s him playing the bike or the giant walkie-talkie. That will be presumably one of the mysteries solved when Stranger Things hits Netflix on July 15. Set in Hawkins Indiana in the 1980s, Stranger Things chronicles the search for a young boy who vanishes into thin air under highly suspicious circumstances. His mother (Winona Ryder) opens an investigation into the boy’s disappearance with local authorities that unravels a series of mysteries involving top-secret government experiments, terrifying supernatural forces and one very strange little girl. A love letter to the ubiquitous cult classics of the 80’s, Stranger Things is a coming of age story for three boys that draws this quaint community into a world where mysteries lurk beneath the surface.